Heartfelt Creations March Alumni Blog Hop! Remember to leave a comment on as many of our blogs as you can to be in the running to win a $25 gift certificate from Heartfelt Creations. Hop starts 8 a.m. EST on Tues. March 29th and closes Fri. April 1st at midnight. The winner will be announced on Sat. April 2nd 2016. 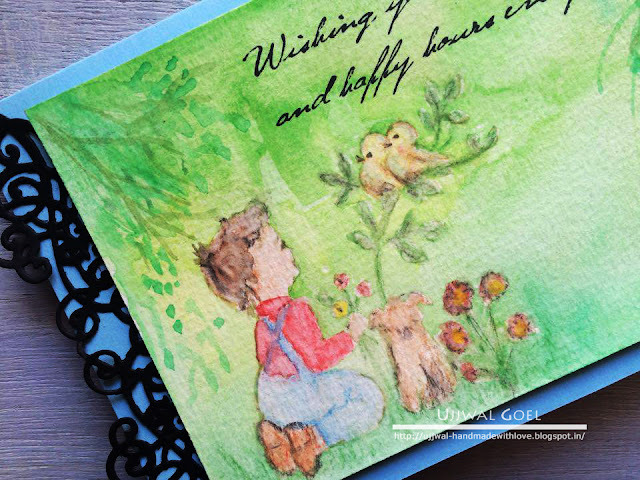 I stamped the image using Lullaby Darlings PreCut Set on Canson Natural White Cold Pressed Watercolor Paper 300 gsm* with Old Paper Distress Ink. I masked the image first using Daler & Rowney Masking fluid and used the wet on wet watercolor technique to build the background. I am using Camel Student Water Color Tube* and Sakura Koi Water Brush*. Once the background was dry, I peeled off the masking fluid and painted the image. I also added some tree branches free hand to add more interest in the background. Next I stamped the sentiment using Chick Retreat Cling Stamp Set using Archival black ink and mounted the panel on a blue Note card base using foam adhesive*. I also added a decorative die cut from the Cut Mat Create 2A Die. I love how it turned out and I hope you like it too. *Affiliate links used wherever possible. Here is the Blog Hop Order to get you started. Oh, wow! This looks hand painted, Ujjwal! What a gorgeous creation! Sweet card...Love the flourished added to the card! This is such a sweet card! I love the die cuts and the colors you chose to work with! Beautiful. Your watercoloring is just perfect. So sweet and adorable! I love the fresh springtime colors and soft water color technique! Such a lovely card!! The scene you have created is lovely! This is so sweet--love your watercoloring. I also love the watercolor look!!! This is great! 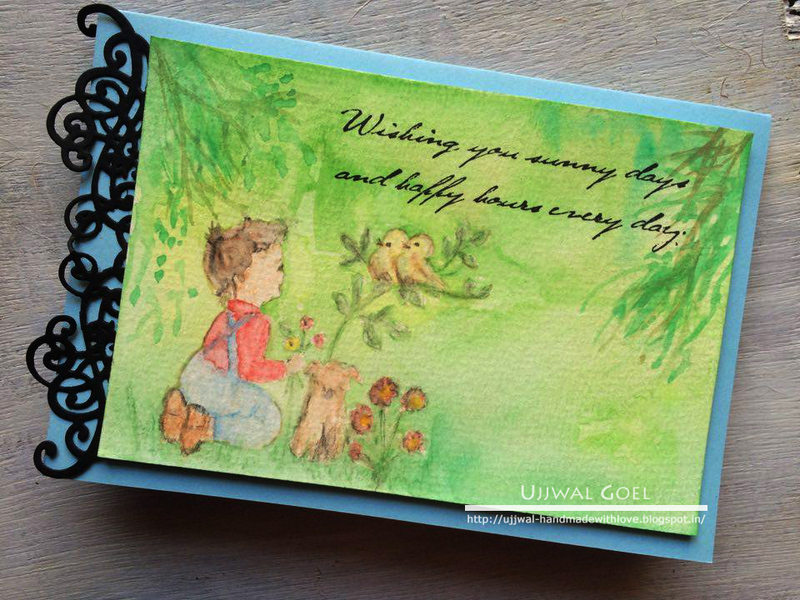 LOve your watercolored card! The black die cut makes a nice bold accent to the soft colors! How sweet this is. Beautiful card. What a very sweet card. love the soft watercolors! Debuting on Mudra Blog ! XOXO - Altenew Peony Bouquet!